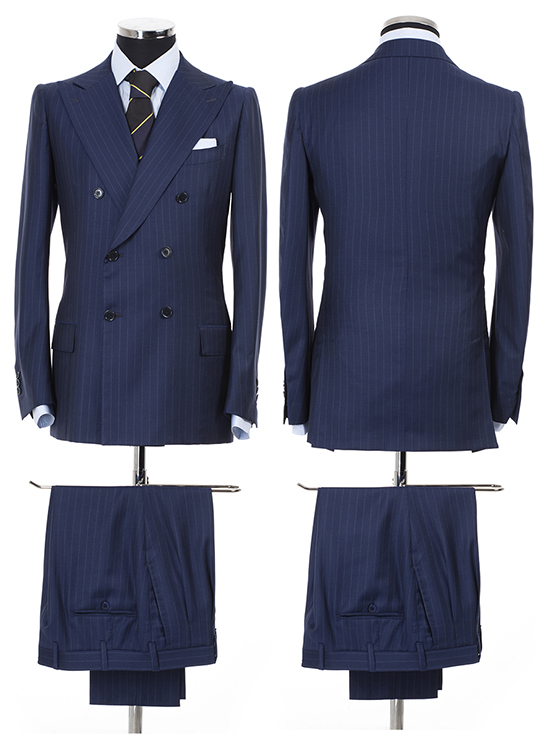 A tailored suit featuring the elegance of the double-breasted with the regality of the blue pinstriped for important moments when style could not be a compromise but a certainty. A blue double-breasted suit made in 100% wool. The jacket follows the classic double-breasted style :6 buttons , large lapels, flap pockets and the classical breast pocket “a barchetta”. The pants have pleats, belt loops, classical pockets and back welt pockets. To complete the outfit, a classical shirt 100% cotton and a matched pocket square, realized in the same fabric as the shirt. Jacket: 100% wool, large peak lapels, 6 buttons. Trousers: 100% wool, pleats, belt loops. Shirt: 100% cotton, classic cut, no breast pocket.